We are still working on restoring the breadth of Nolan’s food options in the wake of his long illness, and he is making slow but steady progress, although returning to a gluten-free diet is taking him some extra getting used to. He is such a big snacker that lately I have been making something like antipasti or cheese plates for his meals. 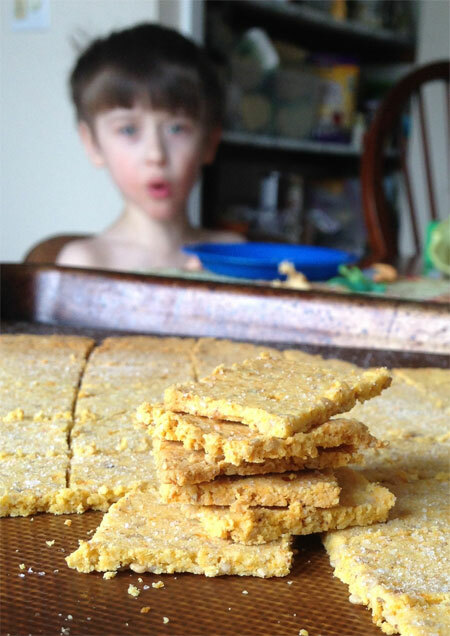 This week’s victory was these grain-free crackers, which are both a good source of protein and a fair source of vegetables, since they are made using fresh carrot pulp leftover from juicing. Nolan has been eating them along with organic apple chips, soaked pecans, and chunks of grassfed cheddar and Wellshire Black Forest ham. These crackers are like a variant of Elana Amsterdam’s almond-sesame crackers, which I occasionally make for Nolan to take a break from his favorite flax crackers. The slightly moist carrot pulp, which is very high in fiber, serves as a replacement for the eggs she uses as a binder when combined with small amounts of olive oil and maple syrup, creating a very workable dough with a bare hint of orange color. I had very little trouble with it sticking to my rolling pin; if it does, just pinch the tear back together and roll more slowly and gently. This batch is sufficient to fill a jelly roll pan, and lasts Nolan about half a day unless I ration them. I intend to try this same method to make crackers with all kinds of other vegetable pulps in the future, but at the moment, I have been going through quite a few carrots lately—both making juices to drink (carrot juice mixed with grassfed cream is a galactagogue, and in other combinations is supportive for the treatment of loose stools) and carrot-apple gelatin (among other variants) for Theo to practice self-feeding. I have started dehydrating any excess pulp beyond what is used in crackers and the occasional smoothie, and will be playing with the use of carrot flour as a substitute for coconut flour in baked goods in the near future. 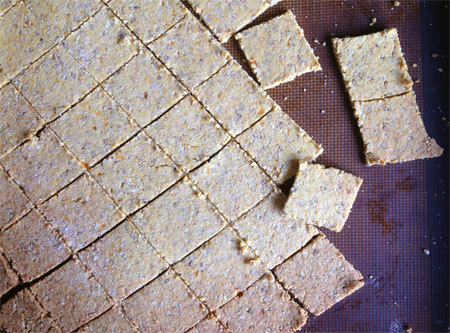 These crackers could likely be made with a range of vegetable pulps, as well as a range of seasonings (think herbs and spices, cheeses like cheddar or parmesan, even kelp flakes). In a food processor fitted with the steel blade, process the almond flour, 1/4 cup sesame seeds, and salt until finely ground, about 20 seconds. 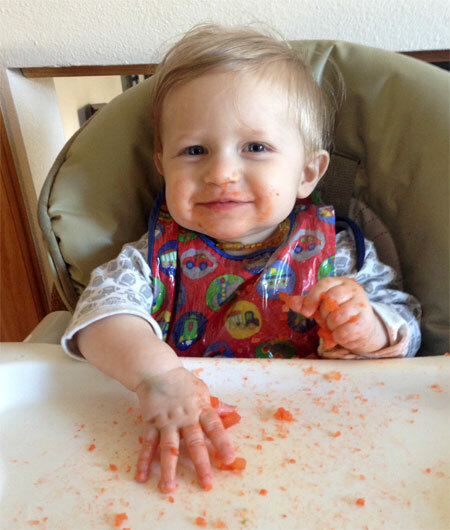 Add the carrots, olive oil, maple syrup, and remaining 2 tablespoons sesame seeds. Pulse just to combine, about 5 one-second bursts. Pat the dough into a thick square or rectangular shape on a silpat or sheet of parchment paper. Roll out into an 1/8-inch thick rectangular shape; if you have trouble with the dough sticking, use a sheet of parchment on top or sprinkle with a little extra almond flour. Transfer the dough, silpat and all, to a baking sheet. Using a butter knife, cut the dough into cracker shapes of desired size and sprinkle with a bit more salt if desired. Bake for 15-20 minutes until golden brown around the edges, rotating the pan once halfway through. Cool completely if you can keep your child away from them (they are awfully tasty warm, however), and break up into individual crackers. Store in an airtight container at room temperature.